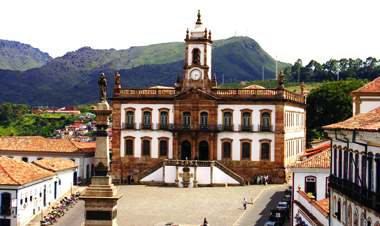 Ouro Preto was discovered by chance  by the pioneers in the 17th century. They were trying to enslave indigenous people, but ended up finding gold. The region used to be called Vila Rica, and was then changed to Ouro Preto. In 1980 Ouro Preto was made a UNESCO Cultural Heritage  site. The city houses the largest collection of Baroque architecture in Brazil and several old churches that are home to great works of Baroque religious art. This beautiful city is located in a mountainous region with waterfalls , hiking trails  and a huge area of native forest. The city is also famous for its lively street carnival and for being home to one of the largest universities in the state of Minas Gerais - the Federal University (UFOP). Another important attraction in the city is Tiradentes Square , in the city center. Tourist will find the Museum of the Conspiracy  there, which contains over 4,000 objects from the eighteenth and nineteenth centuries, representing Brazil's colonial period. Ouro Preto has a population of just over 70,000 people and is 96 km from Belo Horizonte. It is also home to the oldest theater in the country, opened in 1770.